Love is in the air this month and we wanted to take advantage and share with you why EVERYONE IS IN LOVE with our rebranding checklist. It has been one of our most popular pieces by leaps and bounds. Rebranding is so fun and so exciting that it is easy to get swept up in the excitement. It is important, though, to stay grounded and laser focused. Is a rebrand absolutley necessary? So, if you meet one of those two conditions, then this checklist is for you and here are three reasons why we know you will LOVE it! One reason to love this checklist is that it is super easy to use. It downloads instantaneously. It's 5 pages with most of the content occupying only 3 pages. This checklist provides easy tips to help you figure out what will be needed in your rebranding process. It can even be a handy tool to help you delegate the different tasks needed to be completed during your rebrand. We get right down to it. We do not want to bore you with lots of fluff 'n' stuff so we jump right to the meat of what you are looking for. You want to know whether to start with your logo or your website? It's in there! Or maybe you are wondering about all of your possibilities for sales tools... it's in there too! 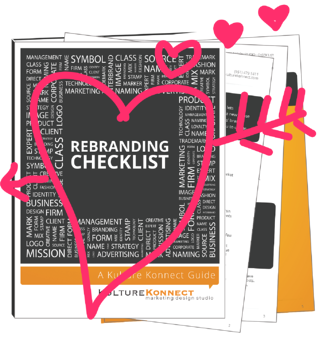 >>Wondering what everyone loves about the rebranding checklist? Check it out for yourself! 3:: It Looks so Pretty. Aw Shucks! We know physical attraction is an important part of the the relationship, so the Kulture Konnect Team took extra care to make this one look good. 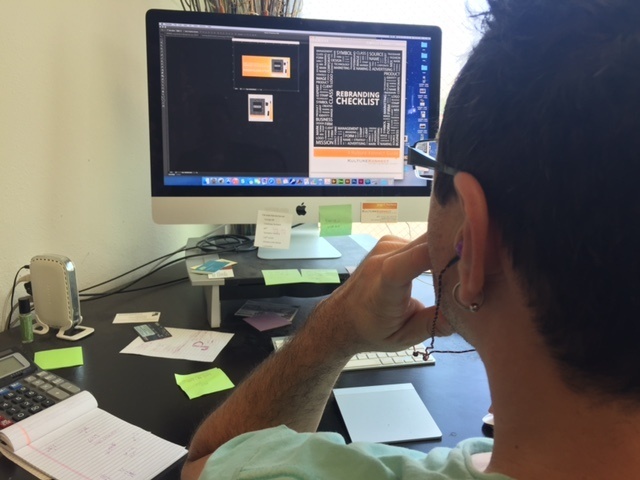 Our very own Creative Director/CEO, Jorge, developed the design for this piece with you in mind. He made it easy to read and easy to follow with clear heading and section breaks. You can look at it all day long. Feel free to hang it up on your office wall! Here he is working on it! We hope you are well on your way to a very organized and successful company rebrand. We know this checklist will keep the team on track and at the very list bring up some elements that may have been overlooked in your rebrand plan.